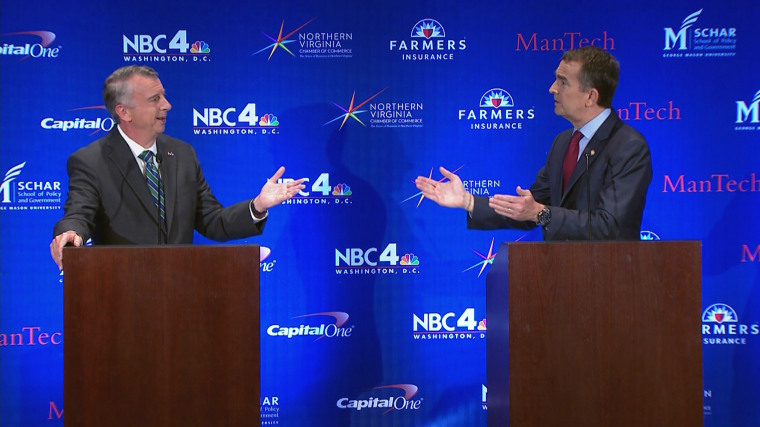 When candidates in the race for governor of Virginia faced off in their second debate Tuesday night, neither could escape national issues tugging at them. MCLEAN, Va. — As the two major party candidates in the competitive race for governor of Virginia faced off in their second debate Tuesday night, neither could escape the national issues tugging at them, including President Trump, health care, and the ongoing disputes over confederate monuments in the state. Lt. Gov. Ralph Northam, the Democratic candidate seeking to keep the seat in his party's hands this November, faced off against Republican nominee Ed Gillespie, a former RNC chairman and onetime counselor to President George W. Bush, in a spirited yet civil debate moderated by NBC’s Chuck Todd. In the wake of racially-motivated protests and violence in Charlottesville, Virginia last month, the local dilemma over whether confederate monuments should be removed became a national flashpoint, and both candidates were pressed on solidifying where they stood on Tuesday. “You know, Virginia and Virginians have always been at the forefront of American history from our very founding, literally, at Jamestown,” Gillespie said. Northam reiterated that he wants to see local governments maintain control of the decisions over statues, but he added that if “these statues give individuals, white supremacists like that, an excuse to do what they did, then we need to have a discussion about the statues." "Personally, I would think that the statues would be better placed in museums with certainly historical context,” Northam added. Gillespie specifically pointed to the marchers who gathered in Charlottesville last month for what was dubbed the “Unite the Right” rally, arguing they shouldn’t be tied to any partisan viewpoints, despite what the rally was called. The battle to be governor of Virginia is the marquee race of the nation this year. Virginia only allows their governors to serve one four-year term, so the state’s current Democratic Gov. Terry McAuliffe is prevented from running again. Gillespie narrowly lost to Virginia’s Democratic Sen. Mark Warner in a very close Senate race in 2014, and this year's gubernatorial race is also expected to be very close. Recent polls show the race evenly split or with Northam in a slight lead. Throughout the race, Gillespie has attempted to walk a delicate line when it comes to his fellow Republican in the White House, President Donald Trump. A once-reliable Republican stronghold, Virginia has trended Democratic in statewide elections in recent years, fueled by growth in the suburbs across the river from Washington, D.C. Democrat Hillary Clinton beat Trump here by 5 points in the 2016 election, though Trump dominated in most of the state’s rural areas. At the debate Tuesday night, Gillespie attempted to veer away from Trump when directly asked about him, instead trying to drive the conversation to the state's economic issues, while Northam multiple times tried to tie Gillespie to a number of the president’s policies. But after the debate, when a reporter asked him whether he would specifically invite Trump to come and campaign for him, Gillespie declined to take his initial answer any further. Northam, a long-time doctor and U.S. Army veteran who previously voted for George W. Bush before his political career began, was asked where he could work with the president if elected, and he said that they could agree on putting an end to sequestration and avoiding government shutdowns. Both candidates were also pressed on where they stand in the current debates on health care dividing both of their parties. While Republicans in the U.S. Senate move closer to looking at the latest attempt to repeal and replace Obamacare — a proposal introduced by Sens. Lindsey Graham, R-S.C. and Bill Cassidy, R-La. — Northam repeatedly tried to tie Gillespie to the measure. Gillespie indicated that he was not a fan of the legislation, saying he believes it “falls short” of not punishing the commonwealth for not expanding Medicaid under the Affordable Care Act. Northam on the other hand blasted the Graham-Cassidy bill, but after the debate he was asked about where he stands on “Medicare For All” legislation like the proposal recently introduced by Sen. Bernie Sanders and supported by numerous Democrats.